It's been a while since I pulled out the wok. Sub-zero temperatures and snow do not bring it to mind, and we have had more than our share of both so far this year. But I continue my goal to eat more vegetables and have been in the habit of always having broccoli in the fridge. I was mostly just blanching it and eating it that way, sometimes tossing it in a light walnut oil and wine vinegar dressing, sometimes just adding salt and pepper and leaving it at that. As quick and easy as that is, and as much as I like broccoli by itself, I find myself looking for different ways to prepare it. I mostly think of stir fry as a grand production, with my "if these ingredients are good, this many more would be so much better" mentality. I will end up with a large amount of little bowls and plates that leave a lot to clean up at the end, and often the flavors compete with each other rather than complementing the main ingredient. I can't remember whether or not I've mentioned it before, but that is one of the things I have been working on this past year or so: less is more. I try to remember and repeat it every time I walk into the kitchen. And you know what? Less really is more, at least in the kitchen. In this case it is an especially good thing. When I keep my stir fry simple, it is a snap to whip one up in a jiffy, with minimal cleanup required at the end. Combine the sherry and soy sauce in a small bowl and set aside. In another small bowl, combine the water and cornstarch and set aside. Have the shallot, broccoli, and ginger garlic paste ready. Heat the wok until smoking. Add the oil and the shallot and let cook for a few seconds. Add the ginger garlic paste and stir for another few seconds. Add the broccoli and cook until just tender. As soon as the garlic and ginger start to brown and stick to the bottom of the wok, pour about half of the water around the edge of the cooking food to create steam and to loosen the garlic and ginger from the bottom of the wok. Cook until the water has evaporated. Repeat with the rest of the water if necessary. 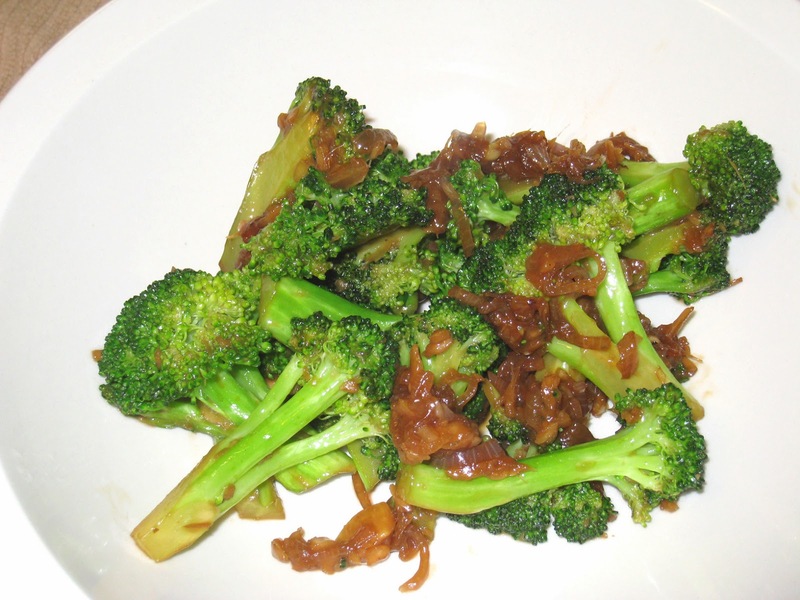 As soon as the broccoli is ready - about 5 - 7 minutes total, add the sherry and soy sauce mixture. As soon as it is boiling, add the corn starch and water slurry and cook until the mixture thickens, about 10 seconds. Remove the wok from the heat and turn the broccoli into a serving bowl to keep it from cooking more. Serve immediately.